From Siracusa we headed inland through some quiet, dry, harsh countryside. Our next destination is Argrigento, down on the southern coast. But we’ve found some interesting places along the way so it turned out to be a good days driving. One of them not exactly as we’d planned. We found ourselves heading towards a tiny old village placed almost at the top of the hill with the narrowest windy road i’ve ever come across. Once you begun the accent there was no turning back, totally committed and fingers crossed we’d somehow find our way out. Nerves and attitudes tested, we made it out again with the help of some locals and were soon laughing!!! Perhaps our GPS had a sense of humour as it was almost as challenging to find Piazza Armenia. Only this time it was a nice policeman (carboniri) that showed us the rest of the way. Here we found the Villa Romana del Casale, another world Heritage site, which was built between 330 and 360 AD by what is presumed a very wealthy Roman aristocrat. The 3500 sq metre buildings are home to the largest and most vivid collection of Roman mosaics in the world. But what is so amazing it that it was completely covered by a landslide in the 12th century and not rediscovered until the 19th century. In fact it wasn't until the 1950’s that a real excavation began. The fascinating variation in scenes on the floors and walls is jaw dropping - from daily lifestyle activities, hunting, fishing and circus events, wild animals and strange creatures to girls dressed in what look like bikinis lifting barbells (perhaps their daily gym routine?). These intricate mosaics were painstakingly created by whats presumed were North African artisians. The variety and number of them is amazing and the vibrancy of colours incredible. I gather it can get incredibly crowded so once again shoulder season travellers win again!! Only two hours from here and we’re back down on the coast with our delightful host, Salvatore, who has given up his family home in Realmonte for us. His English is not great but our Italian is even worse, so it was one of those lovely scenario’s where there was lots of pointing and laughter. When we came to leave we were humbled to discover he was working with the Sicilian Coastguard either rescuing or helping to process the hundreds of refugees who were fleeing Syria by boat. He was exhausted after many long days and very little sleep but his attitude was great. ”We are a small country, with little to offerbut what are we to do? Turn them away and watch them all die?” It really struck us being here on the frontline versus hundreds of miles away in the comfort of your own environment. He even had a small gift for us, of some local pottery which his wife had hand painted. One of those special people who reminded you what travelling meeting new people is all about. Its dark when we arrive so it was such a pleasure to wake up the next morning and enjoy a spectacular view of the coast - stunning blue sea and golden sand beach!!! We’ve been told that this is where we’ll find the real Sicilian way of life, far more low key and not directed purely at the tourists. Although contrary to this belief we find most the village is closing down as we’re ‘out of season’. All good as long as there is coffee available!!!! From Realmonte we can stroll along the beach with the clear turquoise water lapping our feet, over the rock pools and then scurry underneath some cliffs to reach the spectacular Scala dei Turchi (Turkish Steps). These amazing white cliffs have eroded in a way that lots like a staircase sloping into the sea and are certainly one of Sicily’s most stunning natural sites. Luckily we could approach it from the opposite end of the beach than most people. So it felt like we had this special piece of paradise all to ourselves until we rounded the corner. Then on to the historical site of The Valley of the Temples. As we’d driven into Realmonte the first night we’d had a sneak preview of the site up on the ridge behind us - the sun was setting and the temples looked breath taking!! But when we got up close amongst these ruins, they're even grander and more daunting than we had imagined. They are regarded as some of the largest and best preserved ancient Greek buildings outside of Greece. 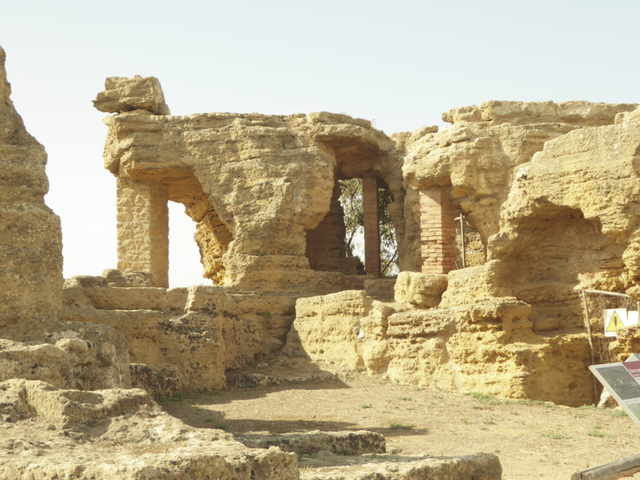 These impressive Doric styled temples, of which there are eight in varying degrees of restoration, date back to the 5th and 6th century and are the remains of the Greek city of Arkrasgas. Once one of the most important cities in the country. It covered more than 18sq kilometres and grew to be one of the largest and most thriving centres of Greek civilisation. Strategically built on a ridge lying just a few kms south of Agrigento it lends itself to amazing views over farmland and down to the coast. As we wandered along the rocky ridge in the searing heat, no shade anywhere, its hard to believe they worked in these temperatures for years building the heavy 30 metre high columns with out any modern technology. From here we head up the hills to the modern city of Agrigento which looks anything but inviting with sprawling motorway bridges and and high rise tower blocks. But as we reach the heart of the city and wander through it we discover some delightful steep narrow streets leading to a number of medieval and Baroque buildings. And even better, a grumpy old Sicilian selling the largest, sweetest, cheapest bunches of grapes we’ve ever tasted.